All articles of the authors: Rodionova T.I., Samitin V.V. The research was carried outgrowing individuals of white laboratory outbred rats. Proportional age ratio of investigated objects and age periods of human was made. Carrying out morphological research on animals with subsequent transferring these data on human purposely to realize the analysis of features of body systems' formation during prenatal and postnatal periods of ontogenesis is obviously possible. All articles of the authors: Gelashvily O.A. 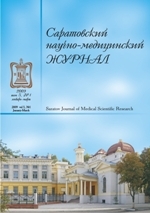 All articles of the authors: Bondar T.P., Polovko Yu.l., Tsaturjan L.D., Vereshchak E.V., Zaparozhtseva O.I. The results of investigation ofcorrelation between patients' sclera colour and presence ofundifferentiated dysplasia of connective tissue are described in the work. The experimental technique, the scheme of determination and the example of analysis of sclera’s colour in normal and pathological states are presented. All articles of the authors: Goremykin V.I., Rytik A.P., Sidorovich O.V., Usanov D.A. All articles of the authors: Tolstov A. V.
All articles of the authors: Semyonova L.S., Erokhin A.N. The purpose ofthe present work was to study the possibility of use the artificial disk «PRODISK» at cervical level after ablation of intervertebraldisk’s hernia. On May, 29th, 2007 the patientwas operated: «diskectomyC6-C7' disk’s hernia removal, implantation of an artificial disk« PRODISK»at the level C6- C7». The patient became active on the third day after the operation, and she was discharged in eight days. Her neurologic symptoms regressed completely. Range of cervical motions was in the normal condition (flexia/anteflexia-35 °-40 °). The pain syndrome was arrested (VAS-2, VRS-1). All articles of the authors: Chekhonatsky A.A., Norkin I.A. , Sholomov I.I. All articles of the authors: Dolgov О .A., Grigorjev K.Yu., Perekhodov S.N. All articles of the authors: Alexandrov D.A., Alexandrova K.A., Gromov M.S., Skorokhod A.M., Tarasenko V.S.